Continuing with her promotional tour for her new album ‘A Million Lights,’ Cheryl Cole was spotted leaving 104.6 RTL radio studios in Berlin, Germany, on Friday. I was going to say the singer was wearing a camouflage look, but those bright green Alexandre Birmin python pumps would be impossible to blend into the background. Wearing her hair in a top knot, Cheryl donned a Boy. 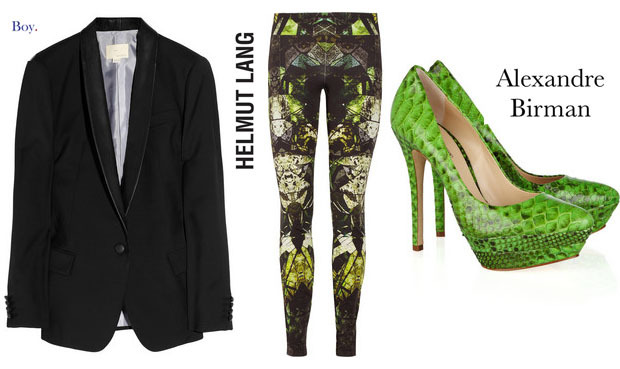 by Band of Outsiders blazer with leather lapels, which we’ve seen before, with Helmut Lang ‘Cicadae’ printed leggings and a green scoop neck top. She accessorized with gold jewels and oversized shades. Top to toe I have to say I really like this look. The top half is chic with an edge and the bottom half provides a colour pop.